Dulymus Jenod "Deuce" McAllister (born December 27, 1978) is a retired American football running back who played for the New Orleans Saints in the National Football League (NFL) . He played college football for Ole Miss. 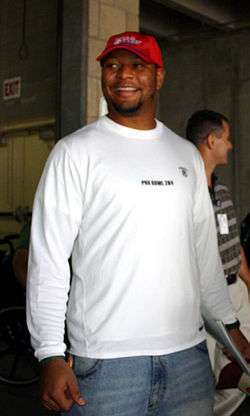 He was drafted by the New Orleans Saints in the first round of the 2001 NFL Draft. McAllister was selected to two Pro Bowls in his career. He is currently the color commentator for the New Orleans Saints on radio flagship WWL (AM) having taken over from Hokie Gajan in June 2016. McAllister runs the Catch 22 Foundation, which is dedicated to under-privileged youth and adolescents in the Gulf South Region. He also owns Deuce McAllister Nissan, a car dealership in Jackson, Mississippi, which filed for Chapter 11 bankruptcy in 2009. He was sued by Nissan Finance, which alleged that the dealership had defaulted on its payments. McAllister's Louisiana home was auctioned off by the Sheriff's office shortly after. ↑ Joel A. Erickson, "Familiar sound: WWL radio announces Deuce McAllister will take over as Saints’ color analyst", New Orleans Advocate, June 15, 2016. ↑ "Saints' magic-carpet ride hits a stone wall in Chicago". The Associated Press. ↑ "McAllister Released by Saints". WVLA-TV. February 17, 2009. ↑ "Deuce McAllister Rejoins Saints". WDSU. January 15, 2010. ↑ "Deuce To Formally Retire, Relinquish Roster Slot". WDSU. January 19, 2010. ↑ "NFL TO SUSPEND STAR CAPS PLAYERS". April 30, 2011. 1 2 "Deuce McAllister Stats". ESPN Internet Ventures. Retrieved 31 March 2014. ↑ Anderson, Roslyn (March 4, 2009). "Nissan sues McAllister Nissan for nearly $7 million". WLBT-TV.